Mesprit does not evolve/is not evolved into. X Known as “The Being of Emotion.” It taught humans the nobility of sorrow, pain, and joy. X „Das fühlende Wesen“. Es lehrt die Menschen die Ideale von Trauer, Schmerz und Freude. X On l’appelle « être de l’émotion ». Il enseigne aux hommes la beauté de la tristesse, la douleur et la joie. X Se le conoce como el Ser de la Emoción. Enseñó a los humanos la nobleza del dolor y la alegría. X Detto “Essere delle emozioni”. Ha insegnato agli uomini la nobiltà di tristezza, gioia e dolore. X 슬픔의 괴로움과 즐거움의 소중함을 사람들에게 가르쳐 주었다. 감정의 신이라 불리고 있다. Y It sleeps at the bottom of a lake. Its spirit is said to leave its body to fly on the lake’s surface. Y Es schläft auf dem Grund eines Sees. Man sagt, sein Geist verlasse den Körper und fliege über den See. Y Il dort au fond d’un lac. On dit que son esprit abandonne son corps pour voler à sa surface. Y Duerme en el fondo de un lago. Se dice que su espíritu deja el cuerpo para volar sobre el agua. Y Dorme sul fondo di un lago. Si dice che il suo spirito abbandoni il corpo per volare in superficie. Y 호수의 밑바닥에서 잠자고 있지만 영혼이 빠져나가서 수면을 날아다닌다고 전해진다. Omega Ruby It sleeps at the bottom of a lake. Its spirit is said to leave its body to fly on the lake’s surface. Omega Ruby Es schläft auf dem Grund eines Sees. Man sagt, sein Geist verlasse den Körper und fliege über den See. Omega Ruby Il dort au fond d’un lac. On dit que son esprit abandonne son corps pour voler à sa surface. Omega Ruby Duerme en el fondo de un lago. Se dice que su espíritu deja el cuerpo para volar sobre el agua. Omega Ruby Dorme sul fondo di un lago. Si dice che il suo spirito abbandoni il corpo per volare in superficie. Omega Ruby 호수의 밑바닥에서 잠자고 있지만 영혼이 빠져나가서 수면을 날아다닌다고 전해진다. Alpha Sapphire Known as “The Being of Emotion.” It taught humans the nobility of sorrow, pain, and joy. 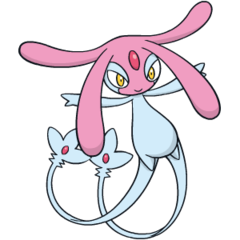 Alpha Sapphire „Das fühlende Wesen“. Es lehrt die Menschen die Ideale von Trauer, Schmerz und Freude. Alpha Sapphire On l’appelle « être de l’émotion ». Il enseigne aux hommes la beauté de la tristesse, la douleur et la joie. Alpha Sapphire Se le conoce como el Ser de la Emoción. Enseñó a los humanos la nobleza del dolor y la alegría. Alpha Sapphire Detto “Essere delle emozioni”. Ha insegnato agli uomini la nobiltà di tristezza, gioia e dolore. Alpha Sapphire 슬픔의 괴로움과 즐거움의 소중함을 사람들에게 가르쳐 주었다. 감정의 신이라 불리고 있다. Diamond It taught humans the pain of sorrow as well as the treasure of joy. It is called the god of emotion. Pearl Although it slumbers at the bottom of the lake, its spirit is said to leave its body and flitter on the water surface. Platinum When MESPRIT flew, people learned the joy and sadness of living. It was the birth of emotions. HeartGold This Pokémon is said to have endowed the human heart with emotions, such as sorrow and joy. 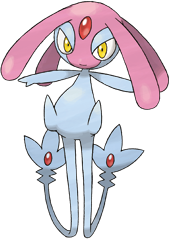 SoulSilver This Pokémon is said to have endowed the human heart with emotions, such as sorrow and joy. Black When Mesprit flew, people learned the joy and sadness of living. It was the birth of emotions. White When Mesprit flew, people learned the joy and sadness of living. It was the birth of emotions. White 2 When Mesprit flew, people learned the joy and sadness of living. It was the birth of emotions.